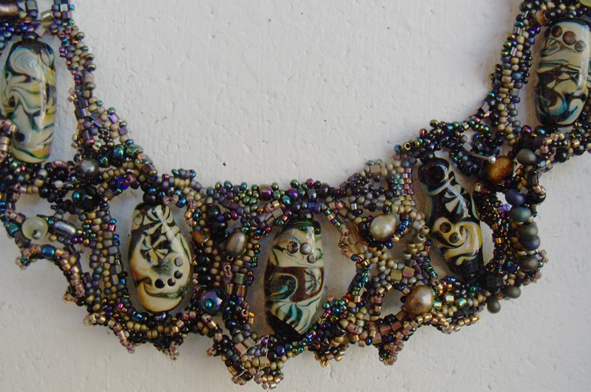 We have concentrated on bead work to advertise the next Master Class given by Ilsa – she describes it as being in ‘Freeform Sculptural Peyote Stitch’ I describe it as an absolutely amazing jewellry – making opportunity where using a variety of bead-work techniques a densely embellished bracelet will be formed – with integral fastening – my favourite aspect of Ilsa’s jewellry – she really has designed elegant and workable fastenings for her bead – work – for this alone, it would be worth taking the class. 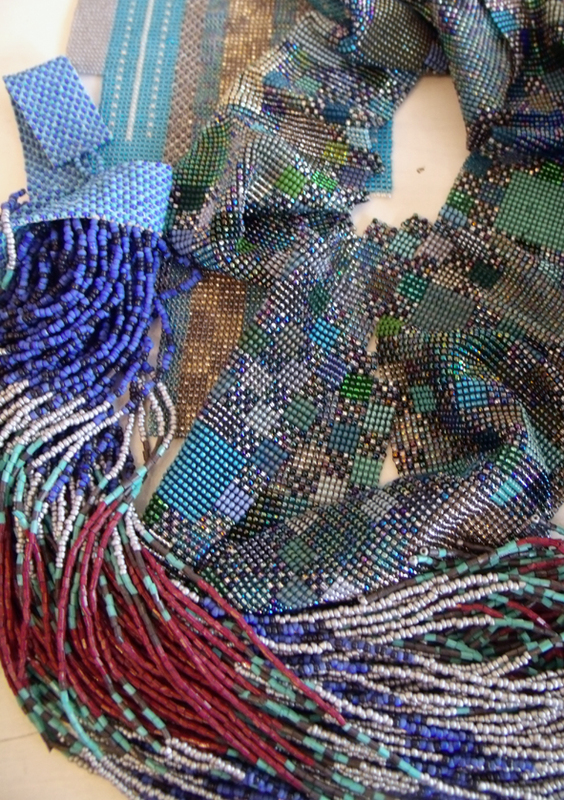 Putting together this beading exhibition was fascinating, seeing how different designers had managed to make such contrasting pieces by using simple beadwork techniques. 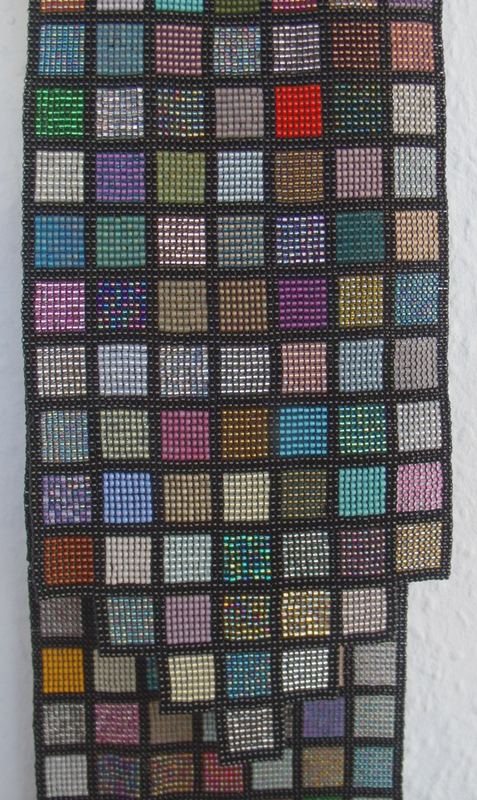 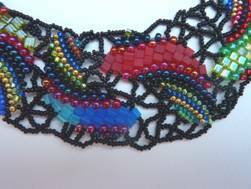 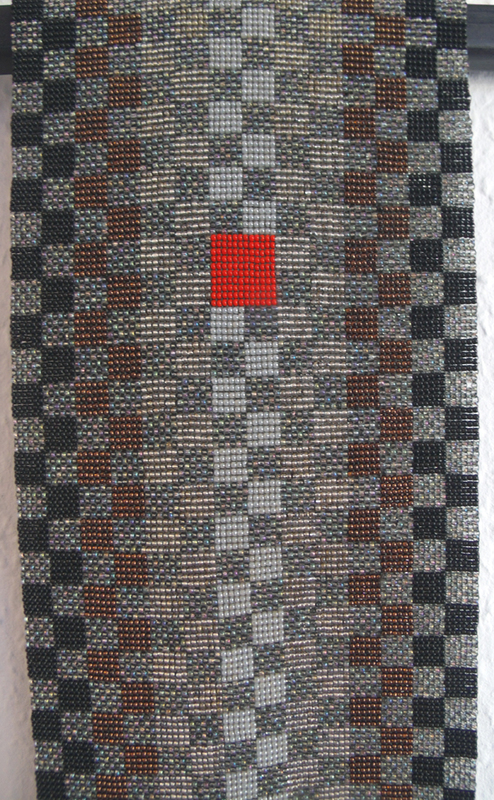 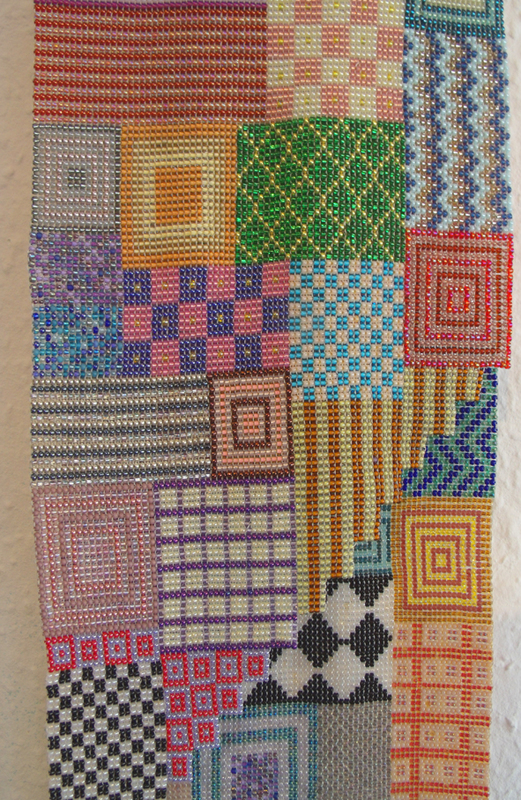 Ilsa Fatt uses Peyote stitch and Janis Taberner and Kristina Ferron use square stitch. 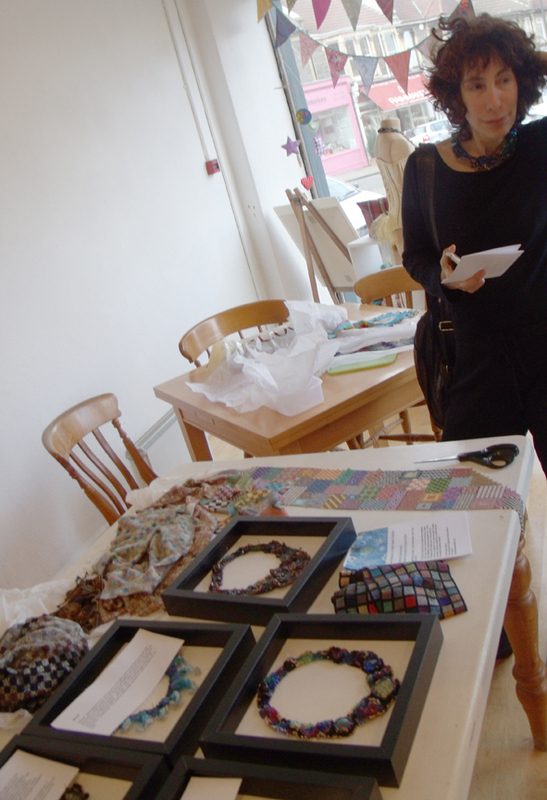 When all the pieces different pieces were assembled they looked wonderful just draped and jumbled together over the tables – I was in favour or showing them draped on the wall, but when we saw the hangers for the Janis’ scarves we realised that formality would reign… but how to place all the disparate work together for a successful exhibition? 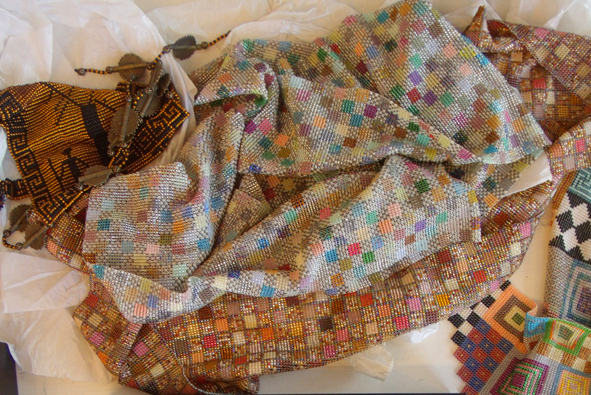 First we placed everything on the floor in the colour groups. 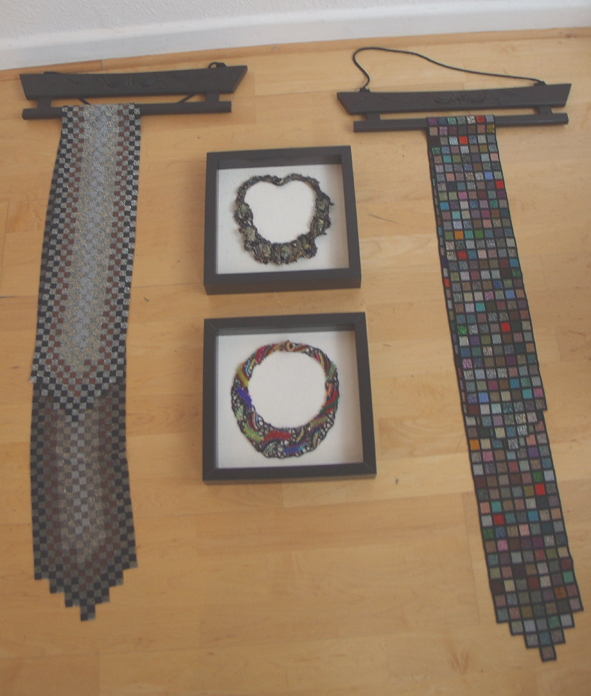 the long scarves made perfect borders for the boxes of necklaces. 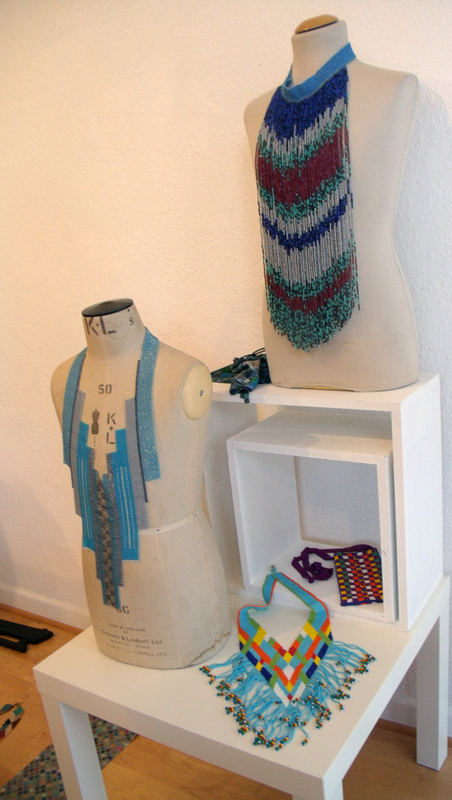 The rich colours of each designer’s work really enhanced each other. 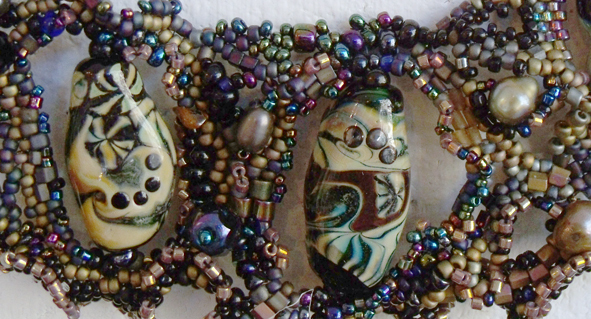 Ilsa is offering students her own lamp- worked beads as part of her Master Class ensuring everyone makes a unique piece of work. 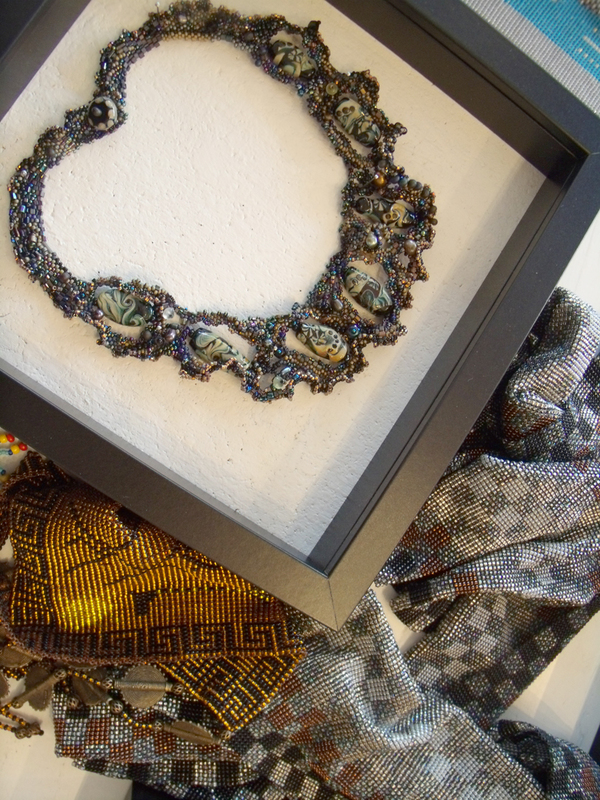 The Blue grouping was easy-peasy – we used small stands and simple boxes to show the work, the brilliant blues and turquoises of Kristina’s ethnic necklaces, Kristina explained that she really likes “Big Jewellry” – a woman after my own heart. 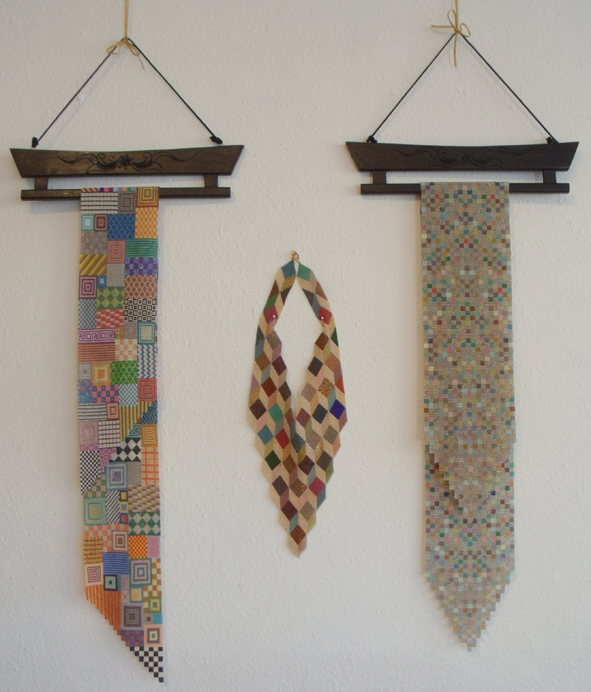 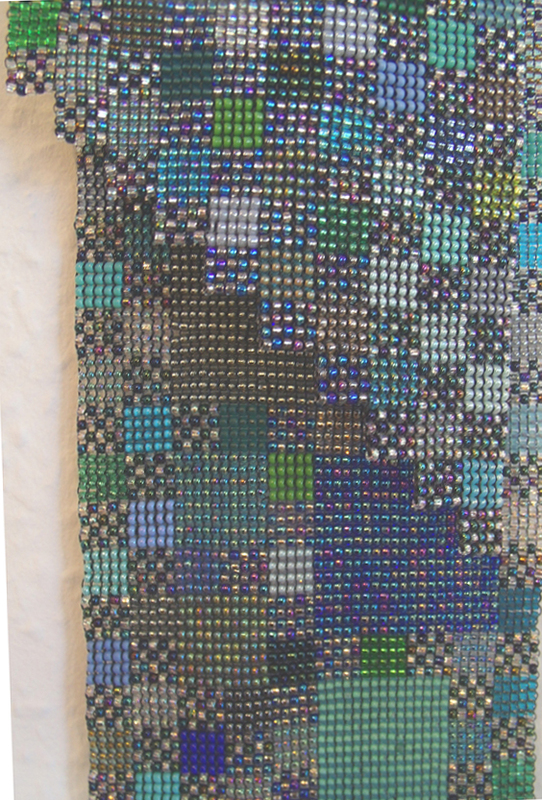 The next group along the wall is in brilliant colours with gold; 2 scarves and a necklace that is based on the tumbling blocks patchwork design – Janis’ background in embroidery shows in her wide range of textile inspiration for these works. 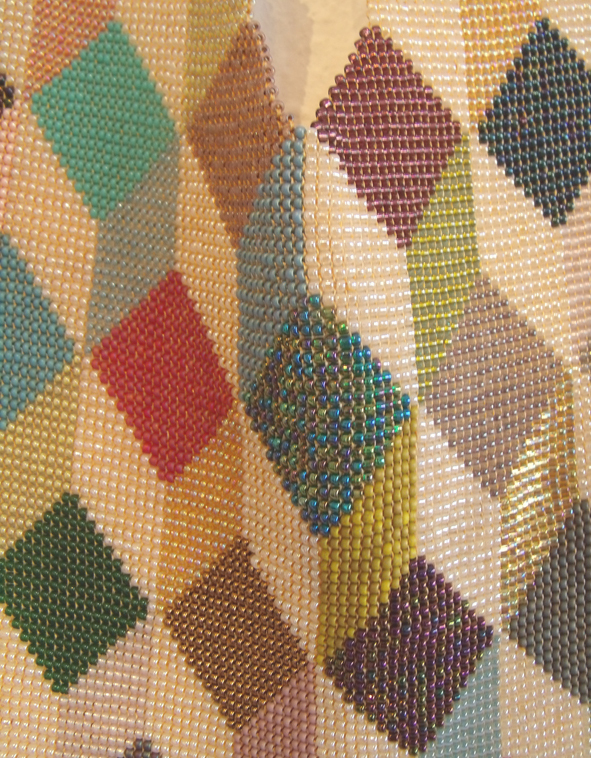 and the last group is a series of different items in gold and autumnal colours made by all three makers, including another collar this time in what appears to me to be a hounds-tooth check pattern. 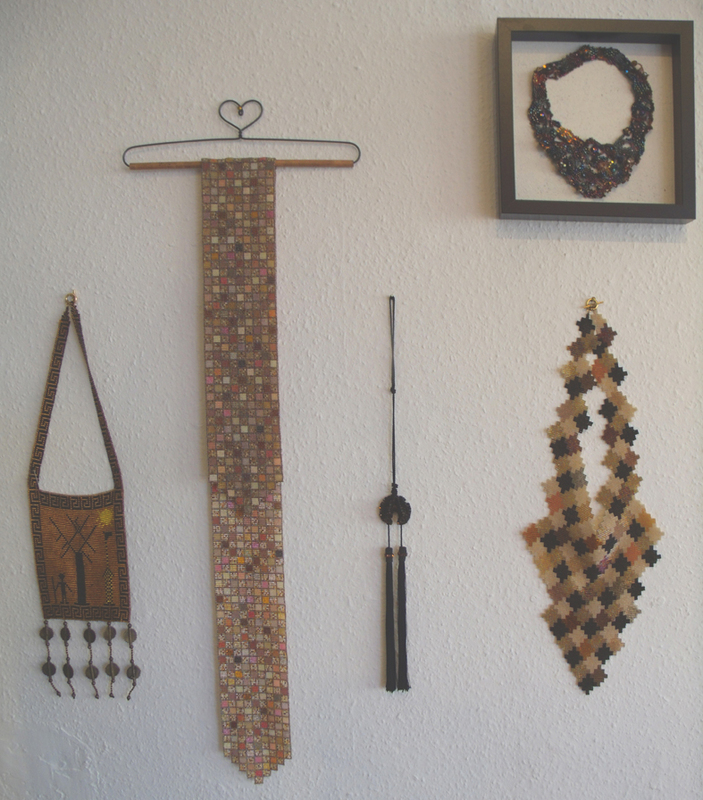 autumn gold group by all three makers. 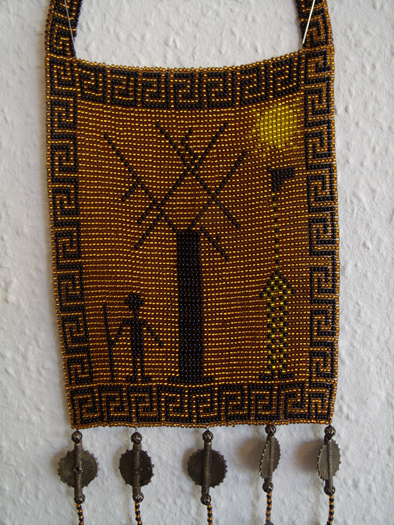 plus a beautiful frilled pendant by Janis where she has also braided the cord and tassell using a Japanese technique. 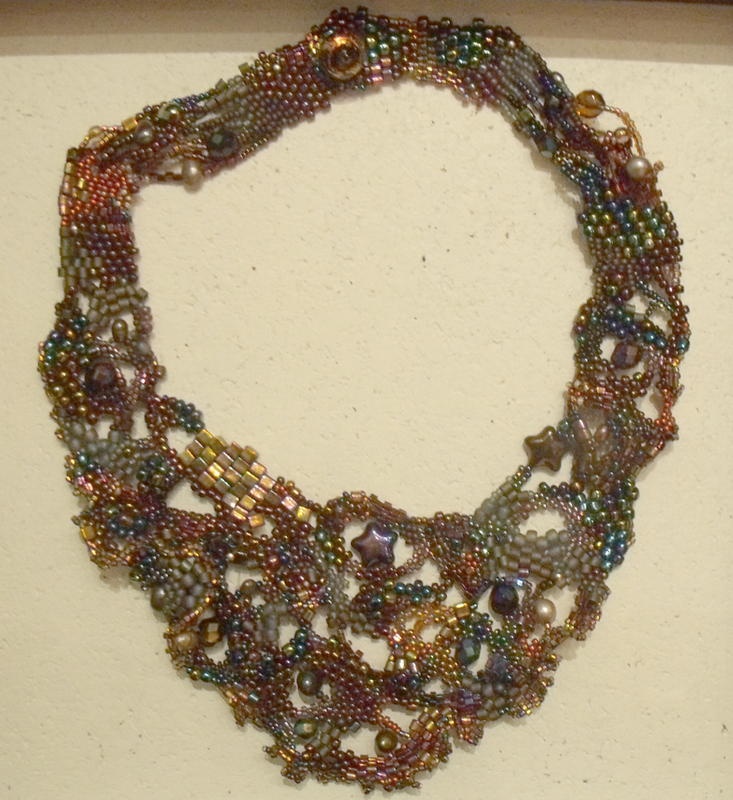 and also this sumptuous and subtle necklace by Ilsa.